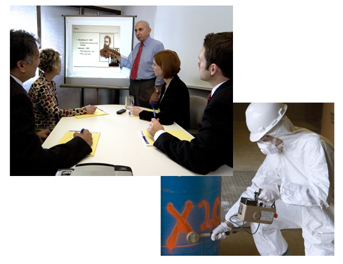 RSSI provides the radiation safety support and consulting that meet individual client needs. RSSI has extensive experience with both the writing of new radioactive materials licenses and the registration of new devices. Our work involving regulatory affairs and intervention on behalf of clients is well known throughout the industry. Additionally, we conduct numerous radiation safety program audits each year, provide the management and staffing for multiple radiation safety programs, offer custom designed radiation safety training and radiation safety officer training programs, and provide expert witness testimony and public education seminars. We provide services ranging from leak and shutter testing to gauge relocation to 24/7 response and management of radiological emergencies.